Well, it was starting fine and dandy until two nights ago when I finally decided to drive it to work and actually rely on it. lol! I got to work fine, but on the way home that evening, I picked up a small knock about a mile from home. About a half mile more and the engine seized. D'OH! So, last night I pulled the rear tires so I could get the bumper off and then pull the engine. Man, this thing has so many mismatched bolts, missing pieces, and wierd little problems! It has definitely been a learning experience. I noticed shortly after I got it that it was missing a nut on the bolt on top that mounts the motor to transmission. No big deal, picked up a nut and fixed that. Last night though when I pulled the driver's side rear tire I noticed something was missing.... THE SHOCK! HAHA! 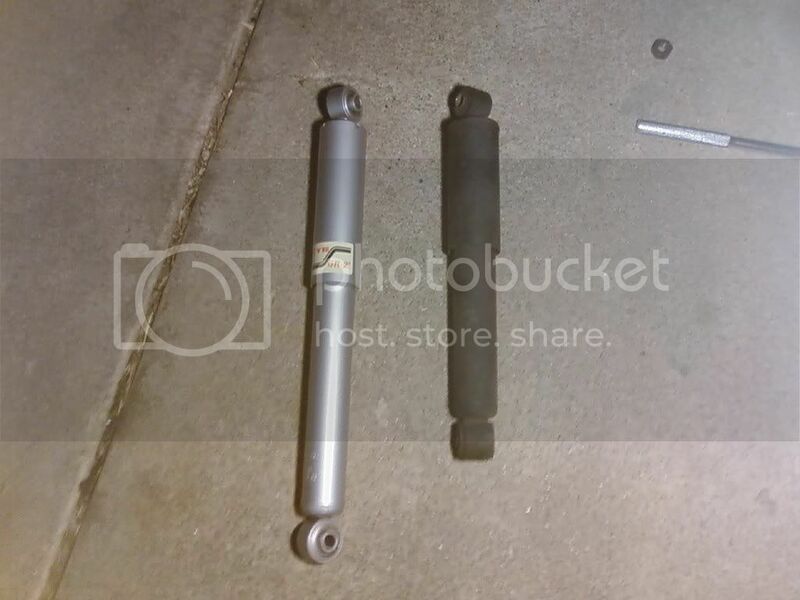 So again not that big a deal, I am not a huge fan of the shocks on the front as they are REALLY hard anyhow, so I will be replacing all 4 I think. One of the lower nuts that mounts the motor to the trans was a 15mm and the other was 17. Its been a really cool learning experience for sure and been interesting to find the odd little things that were done to the car and need redone. Haha! But, I did get those new pushrod tubes in the weekend before the engine seized. Goin on a short camping/fishing trip this weekend up to Lynx Lake in Prescott so the baja will be on hold until next week after Thursday. Sorry to hear about your troubles. Did you check the oil level recently? Yup, I put new oil in after changing out the pushrod tubes. Kind of strange. No biggie though. Like I said, I am learning alot and having a good time tearing into it. I just want to be clear that there are NO hard feelings towards you Sample and I totally undertsand that none of this is your fault. I am going to tear into the motor whenevr I get a chance, but just spoke to a guy here at work who has a 1600sp with new chrome and everything that he would let got of for 200 maybe less. So I have that as a backup plan if I totally annhialated(sp?) this motor. That is a great deal on the 1600. I know it! I am thinking I may pick it up for a backup if I can scrounge up the extra dough. I mean heck, just for all the new chrome it would be nice! I am not sure a 1600sp would roll those 31's real well, but if nothing else, it would be a nice temporary fix and later on, a backup! i ran a 1600sp, with my 235/75r15s and steel rims. did good. Got it last night. All new chrome kit still sitting in the box. He tossed in the stock exhaust, a generator, rebuilt carb, an old and a new air cleaner, and a bunch of other little goodies that I don't really need. LOL! If anybody needs something let me know. His son is tearing the car apart and isn't going to use much of it so he said that if there is anything else I need, to let him know and he will bring it in for me instead of just tossing it. I thought it might be nice to have the stock exhaust and all just in case I decide to want a heater this winter. Haha! Let me know what he has to get rid of, I need seats, interior parts, motor parts brake parts. I am tring to get my Baja going and my sons should be here sometime next month and its just a shell so I could use just about anything. Again let me know if you need any help with your Baja. Did you get the valves and rockers all tightened up properly after removing the push rods to take the old tubes out? Just curious about the engine now. Yup! I just let it run dry. It was my own stupid fault. Tightened and adjusted the valves and tightened the rockers and everything. Had my old man check my work too just to be on the safe side as it was something I hadn't done before. I just let the oil run dry. I will be kicking myself over this for a while trust me. What is the status on the Bug now? I told him to get on azbaja. so any time now he will reply! YIKES!!! 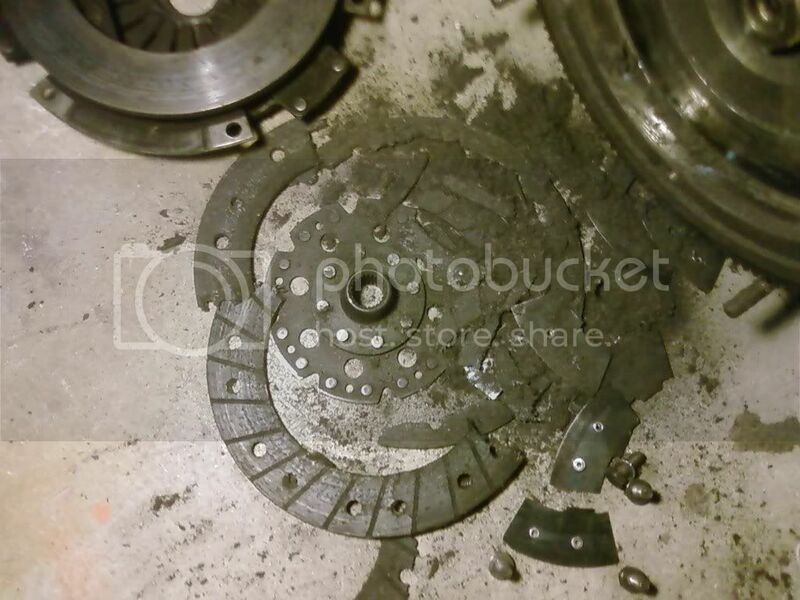 Shredded clutch disk. I wrote it off to just being old and sitting in the sun for a while before I bought it off my boss. Put in the new disk, pulled the carb out of the dip, rebuilt it and thought I was ready to rock! Tok off down the street... Uh-oh.... PUMP THE BRAKES!!! Lol. Had hardly any brakes at all. Flipped it around and headed straight back. By the time I got back to the other end of the cul-de-sac, there was brake fluid EVERYWHERE! Turns out I melted the right rear axle seal and destroyed the cylinder on the same wheel. No big deal, had an extra cylinder or two from when I had my sandrail. Put that in and went to BAP and bought a new seal and put it in as well. Now she runs great! Real smooth. The only thing that needs attention now is the right rear tire. It goes flat overnight. No biggie though. My dad had an extra 31" BFG all-terrain laying around that was brand new. He had it as a spare on his pickup, but has since gone back to a little smaller tire. Just got to go get it mounted and balanced. On another note, I got the new shocks in a month or so ago and installed them in the rear too. Makes for a much smoother ride when you have a shock on EACH side. lol. So, it has been a fun learning experience for sure. Hoping to get that tire mounted and balanced this weekend. Then I can start driving it to and from work. WOOHOO!!! So close! That sounds great! I see you have my luck. Glad you are getting all of the little things worked out.